New study reveals earliest known plant-based dyes in Israel, dating back to the reign of Kings David and Solomon. Evidence of the use of plant dyes from the time of Kings David and Solomon has been recovered, according to a new study. 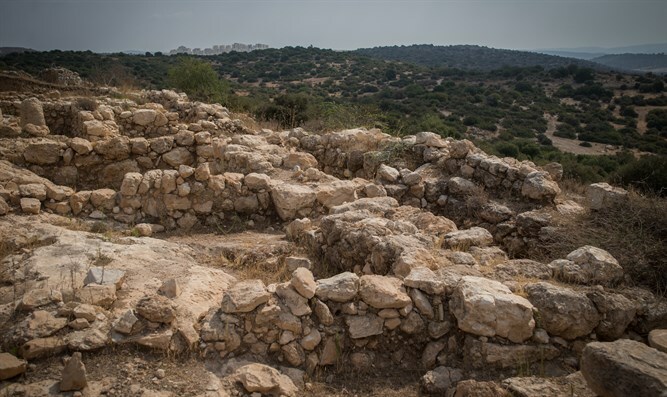 The research published today (Wednesday) in the prestigious journal PLOS ONE was led by Dr. Naama Sukenik of the Israel Antiquities Authority and Dr. Erez Ben-Yosef of Tel Aviv University, in cooperation with a research team from Tel Aviv University, Bar-Ilan University, and the Israel Antiquities Authority. Excavations conducted since 2013 in the Timna Valley and directed by Dr. Erez Ben-Yosef of Tel Aviv University have recovered dozens of fragments of 3,000-year-old textiles, which were preserved thanks to the region’s extreme arid climatic conditions. The textiles date to the early Iron Age (12th – 10th centuries BCE), the time of the biblical kings David and Solomon and some are decorated with a red-and-blue bands pattern. These are the earliest examples of plant-based dyes in the country and in the Levant (the Eastern Mediterranean). The dyes were identified at the Bar-Ilan University laboratories using HPLC advanced analytical equipment. On analysis, the data indicated the use of two main plants: Madder, whose roots provided a red dye, and indigotin – probably produced from the flowering woad plant– which was used as a blue dye in a long and complex process involving reduction and oxidization that lasted a number of days. Both these plants are among the best-known plant dyes in the ancient world. Once grown specifically for dyeing in Eretz Israel, their use continued up to the discovery of synthetic colors. The textiles from Timna were colored with true dye, which is characterized by a chemical bond between dye and fiber, attesting to professional knowledge and skill in the art of dyeing during this period. The colored woolen textiles came as a surprise to the researchers, since during the Iron Age Timna was principally an important smelting and mining site for the production of copper. According to Dr. Erez Ben-Yosef of Tel Aviv University and Dr. Naama Sukenik of the Israel Antiquities Authority, “The findings indicate that the society at Timna, identified with the Kingdom of Edom, was hierarchical and included an upper class that had access to colorful, prestigious textiles.” The context in which the textiles were found suggests that the metalworkers responsible for operating the smelting furnaces were members of this class. The task of turning stone into copper demanded considerable skill. It was one of the most specialized crafts of the ancient world and the metalworkers apparently enjoyed high social status and wore distinctive, colored garments. In this sense, the findings are a real innovation, since they contradict the previous research supposition that the furnaces in the heart of the desert were operated by slaves. The rare find of 3,000-year-old dyed textiles provides an exceptional opportunity to address intriguing research questions, including: The “fashion” of elite in the Iron Age, social stratification and organization of early Edom, the economic status of the local population, trade connections, technological capabilities, etc. These rare textiles are being kept under strict climatic control in the Israel Antiquities Authority’s organic-materials storage facility.